"Man is retrogressive in many aspects of his existence, namely social. War, famine, discrimination, etc. still exist in our world. 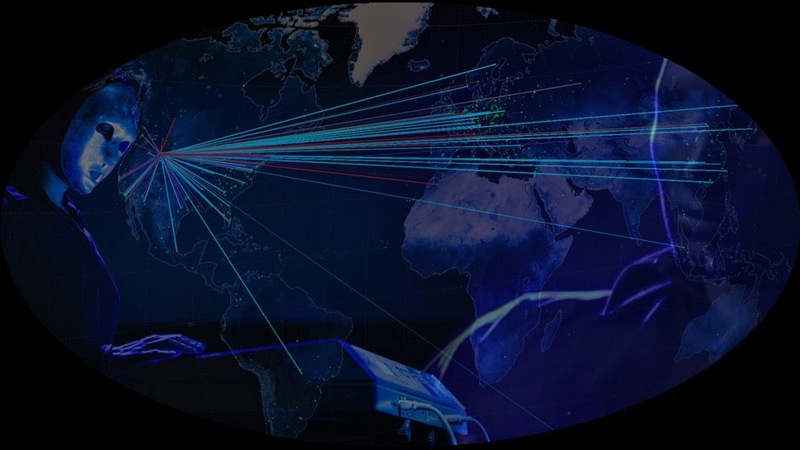 So I do not see a very bright future for mankind at this point, there is much work needed to be done and more evolutionary stages have to be fulfilled." There is a new Dopplereffekt interview with Heinrich Mueller and To-Nhan Le Thi at Boom magazine. It is to coincide with their appearance this Sunday at the Clockenflap festival in Hong Kong, China. I knew there has been some unofficial Drexciya merchandise such as T-shirts available in the last few years but I was surprised when I did some research and found you can also get hoodies, mugs, iPhone cases and even pillow cases with their name and logo on them as well. This merchandise I found from at least three different companies that use the same Drexciya logo from the Journey of the Deep Sea Dweller series and in one case the album title as well. I would have thought that either Clone, UR or Drexciya would have held the copyright for this and could stop anyone from using it but I'm not sure of the law in this regard or if it would be worth their while to pursue it (the sales might not be that significant). One of the companies producing them is called Bees Knees Tees and they also produce T-shirts, mugs etc with the names and logos of a lot of other techno artists as well. On their Ebay listing they do say "Unless otherwise stated, all items are 100% unofficial, and are in no way endorsed by, or affiliated with any of the people/personalities or companies stated." As Drexciya are bigger now than ever I think its worth posting this perhaps obvious information here in case you might not be aware of this and think that a percentage of your money might be going to Drexciya or James Stinson's estate. One of the reasons for this of course is that there are no official Drexciya T-shirts or other merchandise available to my knowledge, perhaps this will change someday. 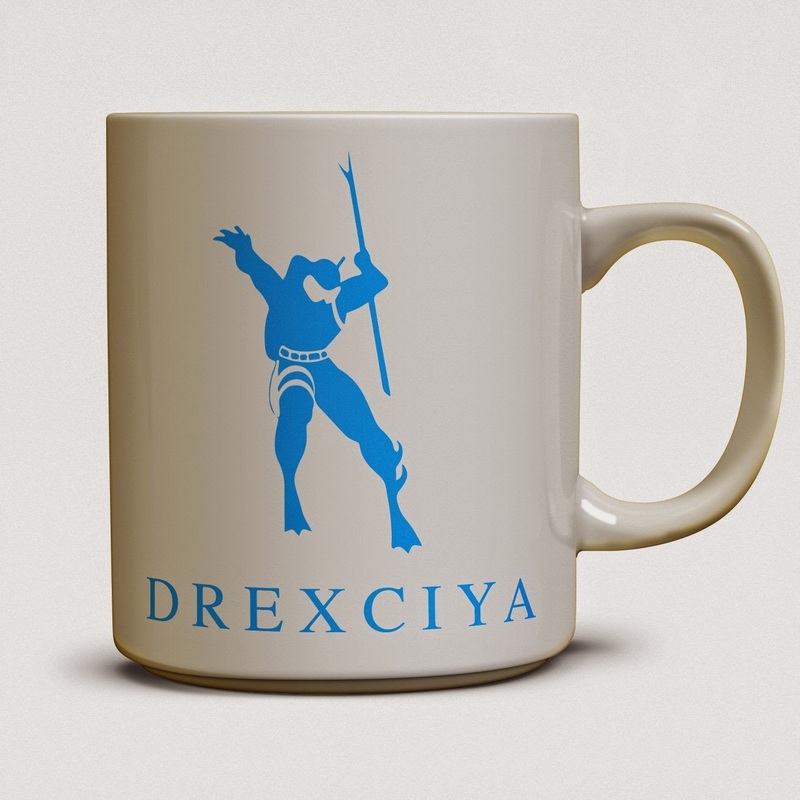 As tempting as it is to have a Drexciya mug in my life, until then I think it would be far cooler and much more interesting to make our own individual Drexciya shirts etc or designs by hand. They couldn't be any worse than the one I just made below. It might also make a great Xmas present for that special Drexciya fan in your life too. 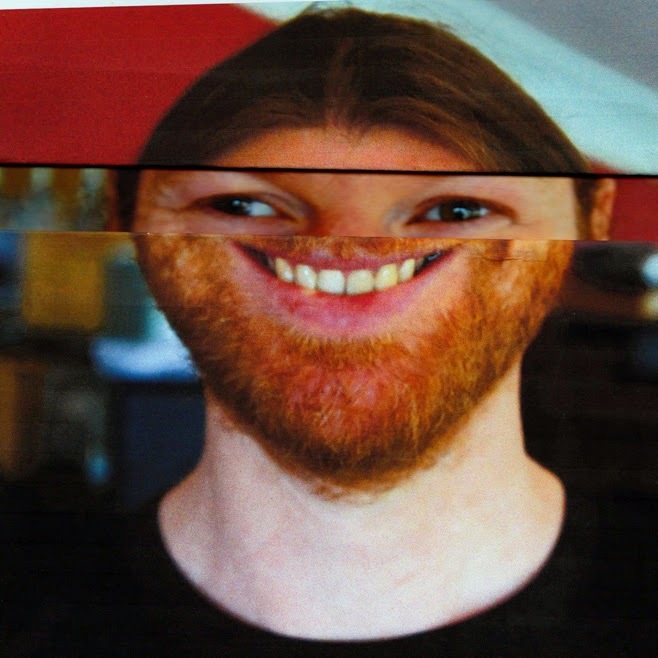 In case you missed it a few weeks back I got a nice surprise while reading a recent and very techie Aphex Twin interview at Noyzelab (very sadly both parts of the interview have since been removed for some mysterious reason, see below) where he mentioned he would like to collaborate with Gerald Donald. Richard D. James has been a long-time fan of Drexciya and his label Rephlex were the first label after UR to licence material by them way back in 1994 with Drexciya 3 aka Molecular Enhancement 12". In later years they also put out albums by Transllusion, Dopplereffekt and Arpanet. The interview has since been archived here for part 1 and part 2. 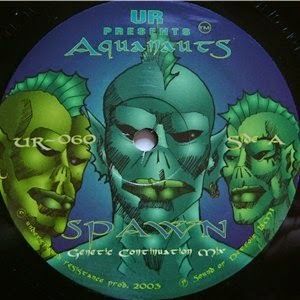 The first interview I did for DRL back in 2008 was with Abdul Haqq aka the Ancient (above second from left) who illustrated Drexciya's Neptune's Lair album. 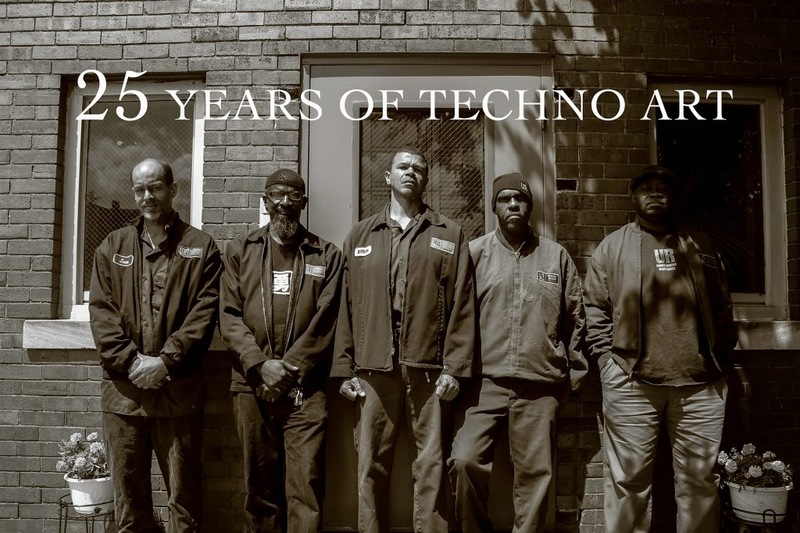 Haqq is a hidden but extremely central and very influential figure right at the heart of Detroit techno and its science fiction roots. He has also done artwork for Model 500, Derrick May, Underground Resistance and many many more. As he has just released his 25 Years of Techno Art book I thought it might be a good time to revisit the interview again. Also one of my readers sent me a scan of a page from his book which includes an intriguing page called 'The House of Drexciya'. It features a photo of the house James Stinson lived in (they lived right around the corner from each other) while they were working on the artwork for the album. The page also includes a short and touching text about his experience working with Stinson as well as the album and Drexciya's legacy. The book also includes his illustrations of the 'Drexciyan Cruiser' and 'Warriors Returning' (both below) from NL. Details of his book can be found at his website here. For my interview I was lucky that Haqq was willing to expand on the detail about his work on Neptune's Lair and his relationship with Stinson and Drexciya. 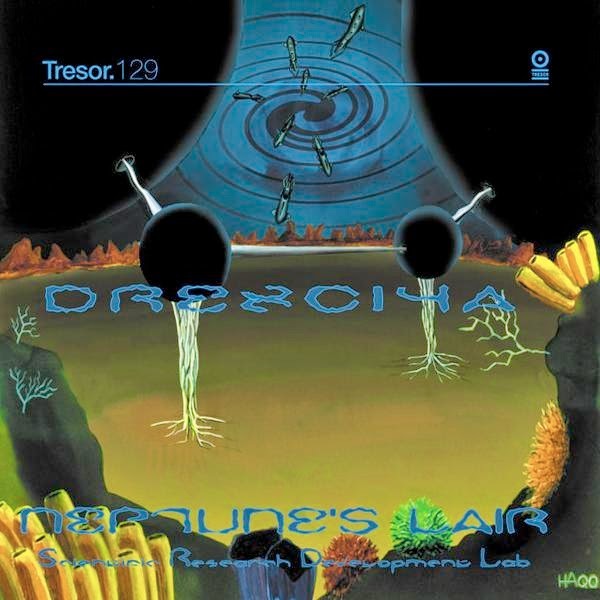 Quite recently Neptune's Lair was also reissued by Tresor. My original post on this subject can still be read here. Q: How did your first professional involvement with Drexciya come about? A: It was in the late 90's when James Stinson approached me with his Neptune's Lair concept. I think it was the summer of 99. It was going to be the first Drexciyan concept album. Q: Did you know them socially already or only when the first project with them arose? A: I knew James Stinson in passing from being at Submerge often. Gerald Donald I knew of even less. Q: Did they have specific ideas for you, just give you the title and track listings or completely leave it up to you? A: James Stinson had very specific ideas about Neptune's Lair. He had their whole underwater world and civilization thought out in his head. He gave me very detailed descriptions and then we worked together on the Drexciyan Warrior and Cruiser. Q: Did you feel any connection or kinship with their dedicated approach to music, the enigmatic presentation of their image and the imaginary world they created with their words and music with the way you work? A: I felt a very deep kinship with James. He was brilliant when it came to science fiction and that's always been my favourite subject matter. When we thought out the concepts of the album together it was very natural for me. I think we worked well together. Q: Did everything you submitted for Neptune's Lair make the finished artwork or was there things you would have liked to have seen added? A: Yes. We pretty much thought out everything together. There wasn't anything extra that I did that didn't go on the album. Q: Was there any other work you would have done for them, outside of Neptune's Lair, which people might not be aware of? A: After the death of James Stinson, I did a tribute painting of the Drexciyan Warrior on a wood panel. The title was "Long live Drexciya". Q: When you did the artwork for Aquanauts what was your instruction, if any or how did you decide to approach it? A: I was instructed by Mike Banks to take the concept to the next evolutionary level if you will. Since James Stinson's brother was in the Aquanauts, we wanted to keep the same vibe as with Drexciya but change it up slightly. Q: The central figure in your Third Earth Heroes image on your websites homepage looks very much like a Drexciyan. 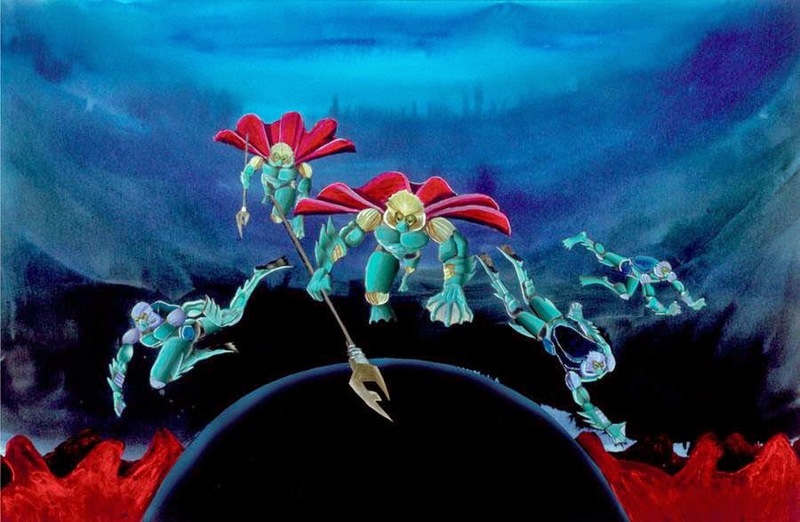 What today is your personal feeling and opinion about Drexciya's music and legacy? A: I am amazed by their achievements looking back after all these years. I think Drexciya was the "perfect storm" if you will. A number of elements that converged to make something unique and sublime. 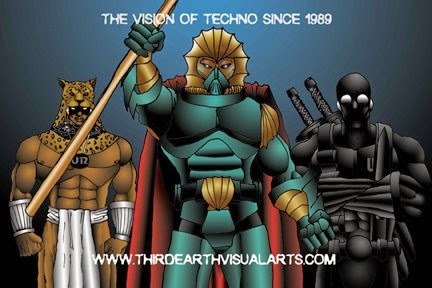 Q: As one of the illustrators of Drexciya's world, even though it was a commercial job, this places yourself amongst the very first artists to be inspired by them to do work. Were you aware that since the death of James Stinson they have had a similar inspirational effect on other artists such as Ellen Gallagher and Kapwani Kiwanga? How does this make you feel about this ongoing process you played your part in? A: This is amazing as I was just contacted and interviewed by Ms. Kiwanga just a couple of weeks ago. I'm really glad there is such interest in Drexciya and their concept. I'm proud to have been the choice of James to be the artist for Neptune's Lair. What's funny is most people don't realize that Drexciya themselves didn't write the most famous story (myth, legend) that they are known for! It was the Unknown Writer! Q: What are your current activities and plans for the future? I hope when it comes out, I will be able to bring it to your country!